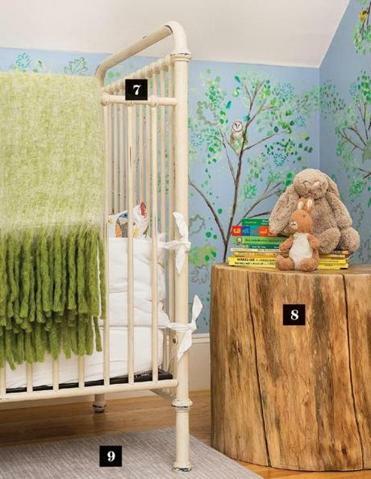 Transforming the study of Cambridge home into a 2-year-old’s room took some imagination. 1. The bright-green upholstery on the Serena & Lily couch, where the family often gathers for story time, echoes some of the hues of the leaves in the mural (see No. 4). 2. Built-in drawers and shelves by the windows offer storage for clothes, toys, and books while eliminating the need for space-eating furniture. 3. Smith & Noble blackout Roman shades ensure that no light filters into the room during nap time. 4. A mural by Tim Murley depicting a forest with verdant trees and animals sets the tone for the room. “We tried to get into the mind-set of what it’s like as a kid being alone in your room. We didn’t want to do anything that was spooky,” says Santosuosso. “Everyone loves a treehouse.” The mural wraps around the room and extends all the way up to the ceiling. “The ceiling is very high, and we were conscious of the fact that, to a small child, the vastness could be a little scary. That’s why we came up with the treehouse theme ,” he adds. 6. A Restoration Hardware Baby & Child tent is an ideal place for a little one to curl up with a book. 7. The painted wrought-iron Restoration Hardware Baby & Child crib has rustic appeal; the green throw is from HomeGoods. 8. A table fashioned out of a tree trunk was custom made by Lisa Warren, whom Santosuosso discovered through her Etsy shop, Project 823. 9. The white and light gray rug from Dover Rug has a natural, neutral appeal. “We didn’t want anything that was too high-contrast,” says Santosuosso.